Cold ions in a radiofrequency (RF) ion trap are among the most promising candidates for quantum information processing and quantum simulation. We aim for combining the superb control over external and internal degrees of freedom in trapped ions with high flexibility for tuning the Rydberg interaction between ions in their highly excited states. Rydberg ions offer a unique opportunity for observing novel effects arising from the interplay between the Coulomb interaction and their giant dipole moments. They are excellent platforms for investigating strongly correlated many-body quantum systems as well as for exploring non-equilibrium dynamics in structural phase transitions and symmetry breaking mechanisms [1-5]. We investigate pathways for multi-particle entanglement and non-equilibrium dynamics. In our experiment, the transition to Rydberg states of trapped calcium is driven by a single-photon at 122-123 nm. 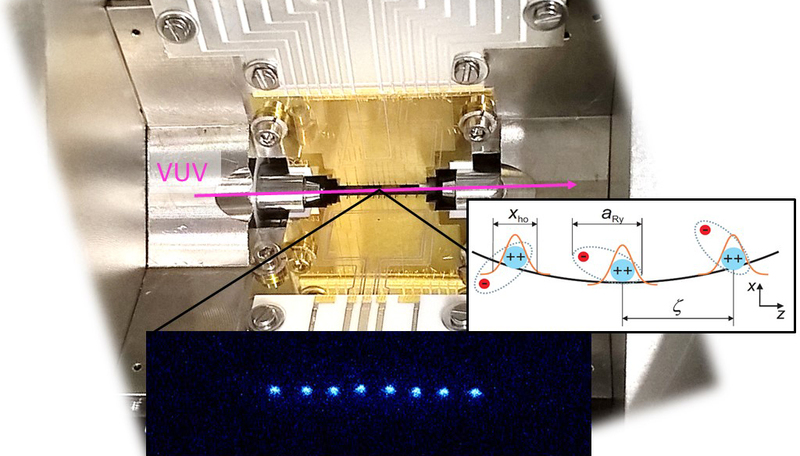 The technology for the generation of coherent VUV radiation has been developed for laser cooling of antihydrogen [6,7]. We work in close collaboration with the group of Jochen Walz, JGUM and HIM. The project started in late 2010 with a first "blueprint" of the experiment which is published in New J. Phys. 2011. Long-range dipolar interactions between Rydberg ions enable designed interactions in linear and planar ion crystals, adopted from F. Schmidt-Kaler et al., New J. Phys. 13, 075014 (2011). Mode shaping in linear ion crystals has been realized using doubly ionized calcium. The Ca++ appear as dark sites in the crystal. Using a six-ion linear crystal, we have observed localized eigenmodes and the Ca++ ion enables the separation of radial modes. Furthermore, we observe structural phase transitions from linear to zigzag, depending on the position of the single ion Ca++. Results are found in Phys. B 2014 . Excitation of a single Ca-ion from the 3D3/2 state to the 52F Rydberg level. This is the first excitation of a single ion to Rydberg levels ever. The high efficiency of the detection scheme is proven. We observed narrow resonances, and the line shape is studied in detail. Furthermore, we deduce the giant polarizability of the Rydberg states and demonstrate the interaction with the dynamical Paul trap field for confining ions. 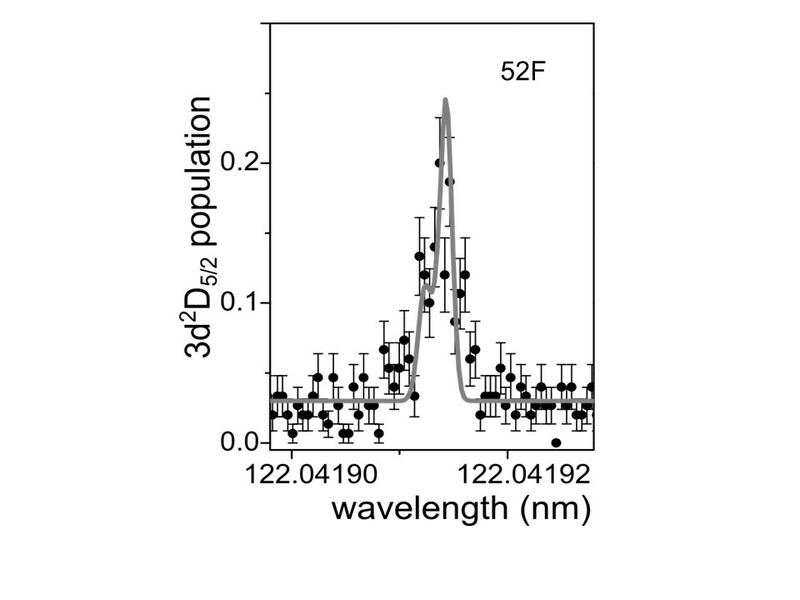 Rydberg excitation of the 52F state of 40Ca+: The solid line is a fit to the model that takes into account the polarizability of the Rydberg state, the electric field of the Paul trap at the ion position and the micro-motion oscillation of the ion in the trap. adopted from "Rydberg excitation of a single trapped ion", Phys. Rev. Lett. 115, 173001 (2015) . In collaboration with the team of Peter Zoller, Innsbruck, we have worked out a scheme for Rydberg-enabled plaquette interaction of six ion spins. This is a building block to realize the Fisher Balents Girvin model. The mode shaping is investigated for the case of a planar ion crystal. Our finding is published in NJP 2015. We have been able to coherently initialize Rydberg excitation and address this on single ions out of a linear crystal. This demonstrates key prerequisites for more complex applications of Rydberg ions in quantum simulation or quantum information processing. We have excited the 22F state from the upper qubit state in the metastable D5/2 level, see our paper "Towards Rydberg quantum logic with trapped ions", J. Phys. B: At. Mol. Opt. Phys. 49 (2016) 154004. 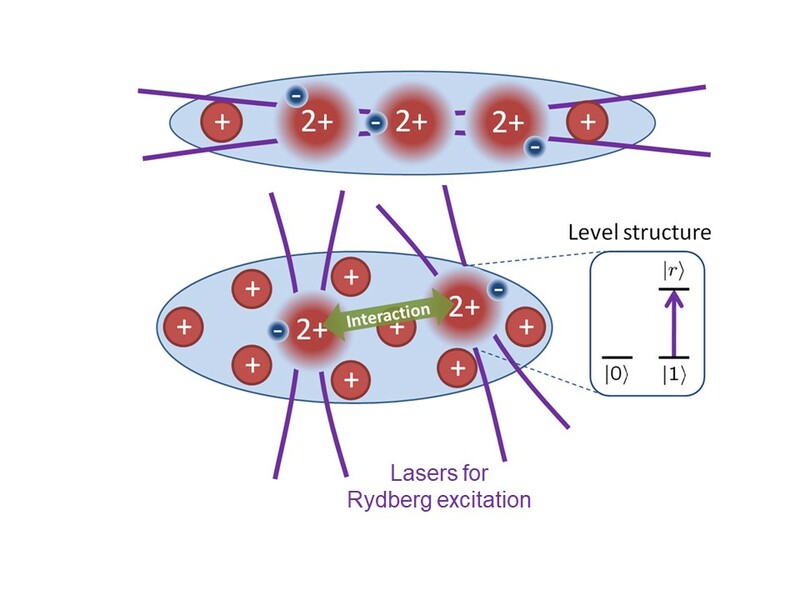 In the next generation Rydberg ions experiment, we aim for implementing a two-photon Rydberg excitation scheme with high-power UV lasers at 213 nm and 290 nm, which will allow coherent manipulation of Rydberg states of ions . My project aims at developing a full coherent control of cold, trapped ions excited to Rydberg states. The superb control over internal and external degrees of freedom in trapped ions will be combined with the high flexibility offered by the Rydberg interaction for tuning the strength and angular dependence of the interaction. New techniques will be developed to generate quantum states that are independent from the trapping field using specific dressed states in a microwave field. For coherent excitation of Rydberg states, I will use a two-photon excitation scheme. In my experiment, the focus will be on multi-ion crystals in linear and two-dimensional arrays, in order to establish a novel approach for understanding the physics of strongly correlated many-body systems. This investigation will pave the way for the implementation of quantum simulators based on fast and switchable Rydberg ions, and thus has the potential application in simulating the transport of vibrational excitations along protein chains. 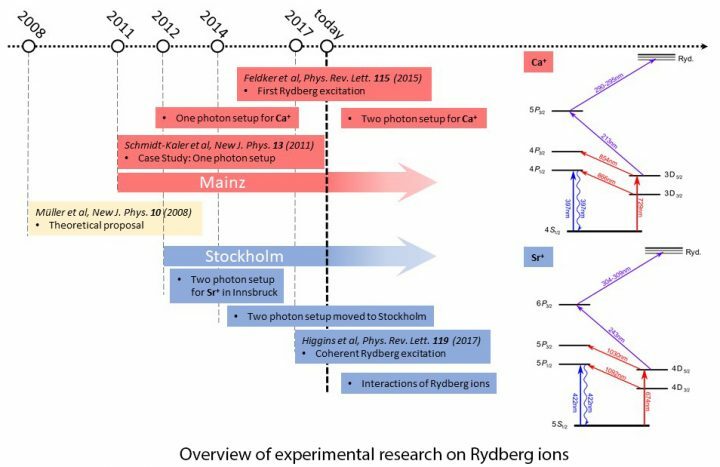 Currently, there are only two laboratories across the world in which Rydberg ions are experimentally investigated: Our group in Mainz and the group of Markus Hennrich in Stockholm. Experimental challenges towards this newly emerged research line necessitate using cutting-edge instrumentations and techniques in the field of Quantum optics and Quantum computation. We have worthwhile collaboration and close knowledge transfer with the Stockholm team in the frame of QuantERA. ERyQSenS, QuantERA project on Entangled Rydberg matter for quantum sensing and simulations, in collaboration with Marcus Hennrich, Stockholm , Nikolay V. Vitanov, Bulgaria , Jean Michel Raimond, Paris, Michel Brune, Paris , Igor Lesanovsky, Nottingham and Weibin Li, Nottingham . Giant interactions in Rydberg Systems (GiRyd) network with Tilman Pfau, Stuttgart and Jan M. Rost, Dresden. This research has received funding from the EU's Horizon 2020 research and innovation programme under grant agreement No. 640378 (RYSC) and is funded by Marie-Skłodowska-Curie grant agreement No. 796866 (Rydion). Additional funding has come from DFG SPP 1929 “Giant interactions in Rydberg Systems” (GiRyd), and the EU-co funded programme through ERA-Net QuantERA for the project ERyQSenS. F. Schmidt-Kaler et al., New J. Phys. 13, 075014 (2011). M. Müller et al., New J. Phys. 10, 093009 (2008). S. Ulm et al., Nat. comm. 4, 2290 (2013). W. Li and I. Lesanovsky, Phys. Rev. Lett. 108, 023003 (2012). J. Baltrusch, C. Cormick and G Morigi, Phys. Rev. A 86, 032104 (2012). K. S. E. Eikema, J. Walz, and T. W. Hänsch, Phys. Rev. Lett. 86, 5679 (2001). D. Kolbe, M. Scheid, and J.Walz, Phys. Rev. Lett. 109, 063901 (2012). G. Higgins et al., Phys. Rev. Lett 7, 021038 (2018).